The Battles of the Third Age (BOTTA) mod is a mod for The Battle for Middle Earth - The Rise of the Witch King. This mod tends to follow the lore of books and films along with bringing the realism in the gameplay, and generally concentrates of the happenings in the Third age of Middle Earth, so you will see almost every character that fought in the battles of this age, for example: Bolg, Beorn, Imrahil, Shagrat etc. Lots of the balance from the vanilla games is fixed so be free to expect some new gameplay styles and new strategies and tactics that you will use in order to destroy your enemy.To do that, you will get help from the new Heroes and Units and their new Powers that are in this mod. No rush tactics anymore, AI wont charge on you in the first 5 minutes, giving you no time to expand your camp and upgrade your economy. Gameplay now focuses on defense, rather than offense like in the vanilla game. So you will have a lot of time for preparing for battle, upgrading your units and level up your Heroes. One part of our journey is over and another begins. I said if we get to the top 100, i will do my best to finish up the new version. In the next few days i will upload some images of new Mirkwood Units, Buildings, Heroes and other stuff, so be prepared. Besides that, im preparing some news update about the new version, so stay tuned if you want to know what the new version brings. Ok, i cannot waste anymore of my free time, im back to modding. Once again, let us unite as an army and go for that MOTY award, or at least top 10. Today i would like to announce the release o f long awaited BOTTA 3.0 Alpha version. 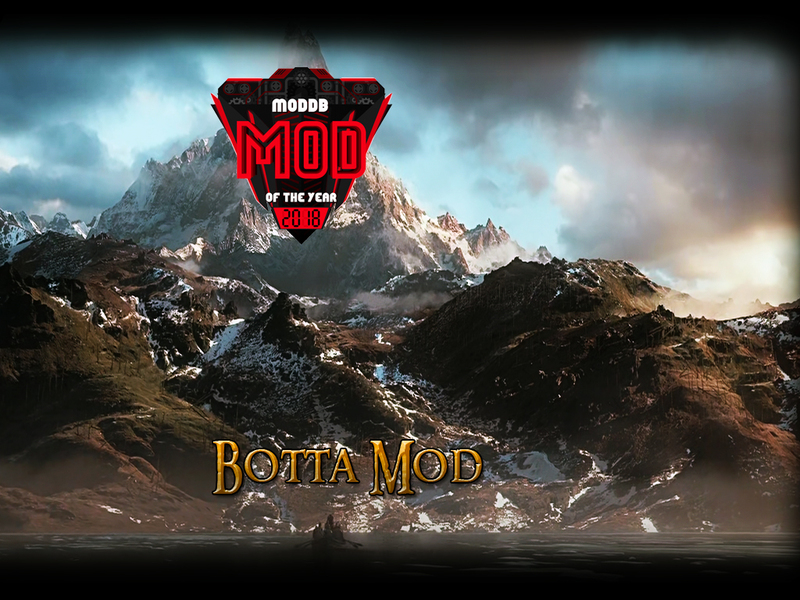 This is the Alpha version of BOTTA Mod. Contains all required files. ello, I installed BOTTA 3.0 and there's no Tauriel, Legolas, Thranduil,gimli gloim... etc. Where are these heros? I mean, is this BOTTA 3.0 an unfinished mod or something? Or am I missing some files or a patch? You are not missing any files. All of the mentioned Mirkwood heroes and maybe Beorn will be included in the upcoming Mirkwood faction. It is unknown to me in which manner gimli will be included. Gloin, I think, might already bee included in any way in the Erebor faction besides all the other dwarves from the Hobbit movies. Thank you for the update, man! Just for clarification: are you in the lower third (meaning at the beginning), the middle third (right in the middle of the work) or in the last third (completing and finsihing) of the polishing? Man, the new erebor units are f****ng awesome! But we thought new version bring finally Mirkwood! Is Mirkwood ready? Good that he have some helper as you who help him out :) Thx again for infos! one of the best mod ever !